AlterPlate frontline performer, songwriter and singer Harrysong has released his sophomore album titled ‘The Kingmaker’. Harrison Tare Okiri popular known as Harrysong delivered a 15-track album (with two bonus songs) on the album with features from M.I. Abaga, Patoranking, Vector, Seyi Shay and AlterPlate affiliates Dezign, Debi J and Mr. Wealth. ‘The Kingmaker’ album is an eclectic body of work following the release of the recent videos for ‘Ele,’ ‘Under the Duvet’ which was shot by Clarence Peters. Producers who contributed to the project are Mystro, Pastor Sam, Twin Beatz, Dr. Amir, DarlingBeatz, JazBlender and of course Del B. The singer teases a collaboration with Patoranking and Seyi Shay off the album ahead of his ‘The Kingmaker’ concert which takes place on the 29th of April, 2018. Collaboration is titled ‘Confessions’. 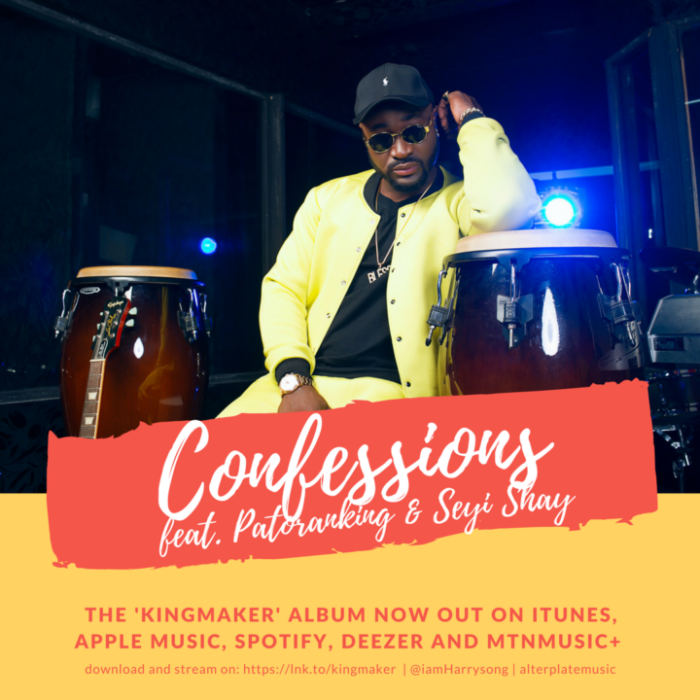 ‘The Kingmaker’ album is a near-flawless mix of sounds and genre that has set Harrysong apart, the award winning performer croons on brilliant RnB songs, freestyles effortlessly, takes a buckload of melodious flow and brilliant lyricism before he climaxes the entire project impeccably. Fans of Harrysong are in for a treat and so are prospective fans – ‘the Kingmaker’ is an amazing body of work.